Arada, Capital, Dovre, Flamewave, Gallery, Gazco, HS Gas, Hunter, Oak, Tortoise, Warm Home, Valor, Yeoman and many more. Gas stoves look like a real woodburning or coal stove, but you do not have to refuel them or empty the ashes. Just turn it on, for almost instant heat. The dancing flame picture in these stoves is extremely realistic and they give out a lot more heat than an open fire. They are also very efficient, meaning that their running costs are low. With most of our brands, you usually have a choice of fuel effects from traditional logs or coals to glass beads, stones or driftwood. Some stoves can also come in different colours, to blend in with your décor. Even if you only have access to LPG (bottled gas), there are many stoves to choose from, with heating performances that will keep your room really cosy on those cold winter evenings. If you do not have a chimney at all, a balanced flue gas stove could be the answer. These can vent out through an external wall or up through the roof, so we can usually find the right stove for you to provide an outstanding focal point for your room. 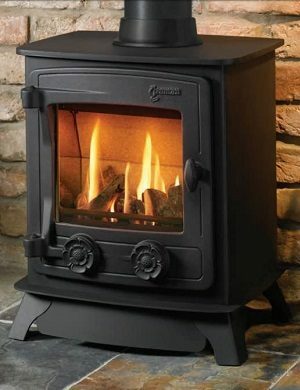 Having a gas fired stove means that you will be warm and toasty even if there is a power cut, as these stove do not usually require an electrical supply. Come and see us, so we can make sure that you have the right stove for you, either for the country or the town, from traditional to contemporary, we will find you one that will suit your lifestyle.